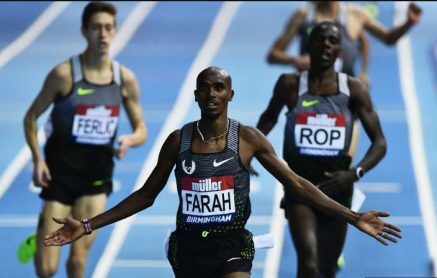 18th February 2017 – Olympic Champion Sir Mo Farah (GBR) was the headline act at the final leg of the IAAF World Indoor Tour on Birmingham, England, and he closed the meeting with a victory and European Indoor record over 5000m. Not only was this the final race of the day but it was also the final indoor race of Mo’s career as he will look to focus on the roads after this years IAAF World Championships. Following a below par performance in his final cross-country race last month he was determined to go out on better terms here and once again he delivered. A group with of four athletes were still locked together with 400m to run and Albert Rop in particular challenged into the final 200m. One last time though Mo showed his strength and speed to cross the line first and set new record figures of 13:09.16. Hellen Obiri (KEN) has cause for a quadruple celebration. In Birmingham she won the women’s 3000m in 8:29.41, a time that was a new Kenyan indoor record. This also meant that Hellen won overall Indoor Tour which with it brings automatic qualification for next year’s IAAF World Indoor Championships. Shannon Rowbury (USA) finished eighth in the same race and Steph Twell tenth in a new indoor PB of 8:45.95. Another Indoor Tour winner was Bethwel Birgen (KEN) who placed third in the 1500m in Birmingham, which when combined with his victory in Torun and second place in Dusseldorf gave him the title in what was a very competitive event at every meeting. Tom Lancashire (GBR) continued his fine indoor form setting a new indoor PB of 3:38.12. Steph and Tom have both been selected to represent Great Britain and Northern Ireland at the European Indoor Championships which will be held in Belgrade, Serbia next month. Andrew Osagie (GBR) continued his return to racing with a very competitive showing in the 800m. Andrew placed sixth in 1:47.02. Shamier Little (USA) continued to work on her flat 400m speed by taking third place in the 52.11 seconds and Bralon Taplin (GRN) was fourth in the men’s event. One athlete who had to withdraw from the meet was European Champion Dina Asher-Smith (GBR) who unfortunately sustained a foot injury in her final training session before the race. Finally, in the US there was a huge breakthrough for Schillonie Calvert-Powell (JAM). Schillonie won her 60m race in the NAU Tune Up in 7.18 seconds taking 0.12 off her previous best.